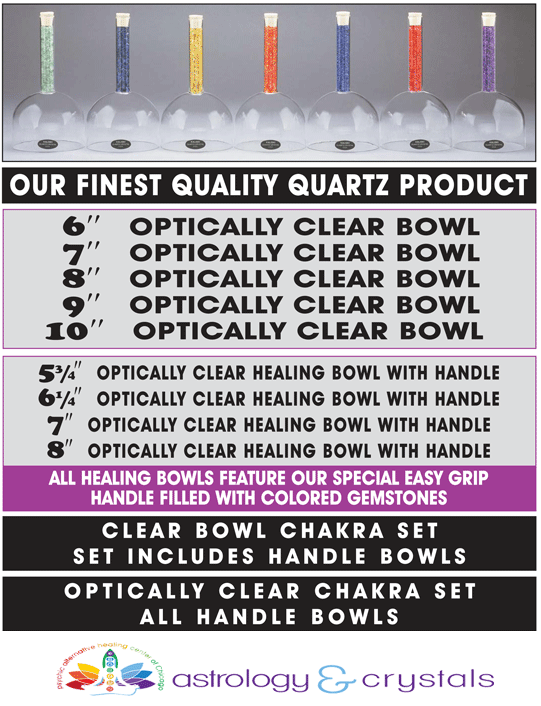 Our crystal chakra bowls are made of the highest quality (99.992% pure!) quartz crystal, making them incredibly resonant. The tones produced by crystal bowls are not just heard by the ear, you feel them in your body, with certain tones affecting your energy centers (chakras) for healing, balancing & meditation. These quartz crystal bowls have been designed with a quartz rod handle which has gemstones for the appropriate chakra. These newly developed healing tools have been specifically created for therapeutic use for both the sound healer and as an addition to any alternative form of healing work. Perfected water and purifying sonic energies combine in bowls that resonate and entrain quickly with the body and psyche. Practitioners often choose clear quartz crystal bowls for transmuting energies. Just as healers in the past have carried pure quartz crystals and small crystal singing bowls in their roles as nomadic priests and shamans, today’s doctors and holistics embrace the clarity and entraining effects of our Clear Quartz Crystal Bowls. Smooth energies flow from these bowls for releasing and clearing work and can also be helpful in creating harmonious energies in the home.